March 2019 - Occasional spoon carver and full time gallery owner Helen Harrison is curating a show in Key West, FL called With the Grain: Contemporary Approaches to Wood Art at the Sanger Gallery of the Studios of Key West. https://tskw.org/tom-majors-tribute-to-wood-with-the-grain . I have three pieces in the show spanning 12 years. August 2018 – My sculpture for McDaniel College’s 150 year celebration was reported in the August issue of the college’s alumni magazine, The Hill. Please click here to read the page. About 2 years ago ABC News sent a filmmaker to my home/shop with the assignment to photograph and film a short piece about my career. Her name is Janet Weinstein and all you see, however brief, is her work. I’m answering her prompts, she edited and composed the short film. She also did not give up on it. She found me via an article that appeared in WV Living Magazine about a year before that. It was a fun day where Janet shot over 4 hours of video and lots of stills. The election buildup was happening and she warned it may takeover the news. We all know that it has never stopped. Over a year ago she said it might never be posted. I checked again several months ago and while she had not given up she was not optimistic. On June 22nd Janet emailed that the video was UP! Yeah. View it	here! Janet has made many videos for ABC News and they can be viewed	here. June 2018 - “Bridge” - Black Walnut – base, black stained Walnut – 45 x 20 x 6 – 2018 – Recently completed commission for the 150 year celebration of McDaniel College, Westminster, MD – My grandfather graduated here in 1900 – his class had 22 students – my aunt graduated in 1930 with a class of 107 and I graduated in 1969 with 175 in my class – Our son, Andrew, #asartoriusceramics , will teach ceramics in a wonderful summer program at McDaniel called Common Ground on the Hill, #commongroundonthehill This summer. Walt Michael, the visionary director of Common Ground conceived the commission and found funding. This sculpture uses wood from my grandfather’s walnut tree - after he passed at age 103 in 1982 the family let me take the tree down and I have used the beautiful and meaningful wood for various projects throughout my career - The theme for the work came from the college seal where “I call you out of darkness into light” appears in Latin. Coming off months of not working it was challenging but rewarding to start with such a large piece. February 2018 - I’m very happy to announce that 8 of my letter openers are now part of the permanent collection of the Peabody Essex Museum in Salem, MA I want to thank Ron Springwater who is my friend and has been my premier letter opener collector for the past 25+ years. He generously donated this work after the curators of Peabody Essex made their choices. Two of the openers are collaborations with remarkable Romanian carver Zina Burloiu. For these I carved the letter opener shape then mailed it unfinished to Zina. She then decorated each one with her exceptional chip carving and then returned the piece to me. You can view images of this work here. February 2018 - Prior to my illness following back surgery last July, I had not been active on social media. Thanks to the encouragement of our son, Andrew, I used my recovery time last fall to learn how to post on Facebook and Instagram and since then have been sharing images of past work roughly every other day. Through this effort I have met many carvers and sculptors previously unknown to me. I also believe that my work is being seen by a different audience that I was accustomed to at shows. You can now find me on	Facebook and at Instagram. November 2017 - West Virginia Juried Exhibition -	“Seahorse” - 9 x 4 x 3 - Australian York Gum Burl - it rests on a steel stand custom built for the spoon by Mark Nantz. It was one of 8 Merit Award winners in the 2017 West Virginia Juried Exhibition - Merit Award of $500. This is the 20th time that West Virginia has held this biannual art/craft competition and the first time the show has been held at the Art Museum of West Virginia University in Morgantown, WV. - November 12, 2017 to February 11, 2018. Merit Award winning work is returned to artists after the show but the larger awards, Governor’s Awards and Awards of Excellence are purchase awards. In this way the State of West Virginia has slowly accumulated a wonderful collection of art and craft for the State Museum. The show is beautifully displayed. I encourage anyone visiting Morgantown to allow time to see this fine show. The Emil Milan Research Project has documented the life and work of noted but nearly forgotten carver and sculptor, Emil Milan. (1922-1985) I was interested in knowing more about Milan because he taught my first teacher, Phil Jurus. Even though I never met him his influence is large in my work. We initially worked from a grant awarded by the Center for Craft Creativity and Design in 2009. That led to two exhibitions of Milan’s work and the woodworkers who had been influenced by his teaching and work. A symposium putting Milan’s career in the context of Midcentury Modern American woodwork was held and that was followed by the opportunity to develop a book. 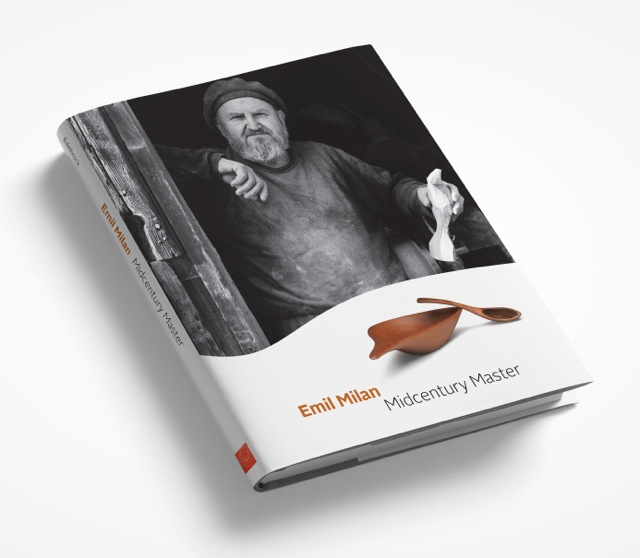 By reading various parts of this site you will better understand the design and the content of Emil Milan: Midcentury Master. A Kickstarter Campaign to pay for the printing of the book has begun ( Oct. 17 through Nov. 15). Dan Saal who has designed our book and who also conceived this path to publishing and printing has led this phase of the project. In case you or someone you know is active on social media Emil Milan: Mid Century Master is there as well. We appreciate all those who have helped us throughout the 10 years of research that has led to this book. Your continued support would be greatly appreciated. If you know of others who may be interested in Emil Milan, please pass this on. Speaking for the entire Emil Milan Research Project team, thank you to all that pledged toward the Emil Milan book on Kickstarter. Your show of support helped us get funded in less than 48 hours. But we've only just begun. While the funding guarantees that those of you who purchased the book will get your copies, we want to spread Milan's story to a larger audience. Please share the Kickstarter with all of your friends. You can be the catalyst that helps Milan's story inspire further generations of artists, curators, collectors, and enthusiasts. Every dollar we raise is critical to ensure the book is distributed to the largest audience possible. There are only about 90 of the limited edition books left so be sure to share with your friends who might love to own one. Thank you again for your amazing support of this project. June 2017 - The Moss Arts Center at Virginia Tech in Blacksburg, VA invited me to contribute to From These Woods, a regional show of wood art on exhibit from June 8th to September 1. Nine of my spoons will be shown, four borrowed from my wife’s collection and five from the collection of Fleur Bresler. Additional information about From These Woods can be found here. March 2017 - I recently learned I will be given an Award for Excellence in the Traditional Arts by Common Ground on the Hill. This wonderful midsummer program takes place on the campus of McDaniel College in Westminster, MD. I graduated from there in 1969 and taught spoon carving in this program for 5 years. The founding idea of Common Ground is that all the problems we face, racism, sexism, ageism, income inequality, whatever, can be improved by sharing experiences in the arts. Common Ground provides a context for those experiences each summer for two weeks ending in a festival. I encourage all to attend. More info here. January 2017 - Norman Stevens, author of A Gathering of Spoons, is one of my two longest standing customers dating back to the early 1980’s. He is a long time friend of the wood field especially spoon carvers. Recently he donated part of his vast collection to the Peabody Essex Museum in Salem, MA. Among those items were a pear wood spoon of mine entitled, Spoon with Three Piercings (2004), and a letter opener carved from Mountain Mahogany. December 2016 - I have been collaborating with Romanian chip carver, Zina Burloiu, over the past two years. First at the 2014 Echo Lake Collaborative at Buck’s County Community College north of Philadelphia. Our recent work included five letter openers. I shaped the openers with my choice of wood and form purposely preparing areas for Zina’s amazing detail carving. Here are five recent examples of our work. If you are not familiar with Zina’s wonderful work do a Google Image search and enjoy. We hope to do more including a few spoons in 2017. Orionid, a spoon of mine from 2014 (click here to view), appeared in a special Collectors of Wood Art show at SOFA Chicago, November 3 – 6 at the Navy Pier in Chicago. Purchases from that show will be handled by sponsoring galleries. There is a catalog from this show. Click here for images from the exhibit. The practice of woodworking spans millennia of artistic endeavors and parallels the trajectory of human achievement. Wood continues to provide inspiration to emerging generations of makers across a spectrum of creative practices. And yet, as concern for the sustainability and conservation of our treasured natural resources intensifies, artists continue to explore the properties of this rarefying substance. Through contemporary works that push the boundaries of the material and mine its properties for inspiration, we encounter the eternal qualities of wood that perpetuate dialogues between makers and material. Featuring a wide range of contemporary art and design by artists currently working with wood, this special exhibit was conceived and will be executed by Collectors of Wood Art, a non-profit organization committed to the development and appreciation of studio wood art (including turned objects, sculpture, and furniture) among collectors, artists, educators, art critics, galleries, museums, and the general public. CWA focuses on: helping people fully appreciate/participate in the field; increasing awareness/acceptance of wood as a special medium for artistic expression; supporting scholarship in the field; and encouraging and recognizing creativity of artists using the medium. March 10, 2016 - On the occasion of the 50th Anniversary of the National Endowment for the Arts, the West Virginia Division of Culture and History honored 50 individuals and 50 organizations whose work exemplified the importance of art in West Virginia. Artists, Craftspeople, Dancers, Authors, Actors, Writers, Musicians, and more were honored. Diane and I attended this event in Charleston where Governor Earl Ray Tomblin presented each honoree with an etched glass medallion to indicate their recognition. It was a wonderful reminder of the rich variety of great work being done in the arts in our state. September 2015 - I was asked to represent West Virginia in celebration of American Craft Week by submitting an image of one of my spoons to their website. Should the spoon sell the funds raised will support this ongoing celebration of handmade American craft. This is the 6th year and there are many events nationwide that acknowledge the contribution of craft. The daily paper here picked up the story (or click here for the article image). July 2015 - In May of 2015 Craig Edelbrock, honorary 4th member of the Emil Milan Research Team, developed a Wikipedia page for Emil Milan. There are many many rules to follow and posting on Wikipedia turned out to be a substantial challenge. Craig worked through those challenges and in late May the Emil Milan page was approved and became public. Wikipedia is one of the most common sources of information today. After the success of his work on Emil Milan, Craig agreed to develop a Wikipedia page for my career as a carver. Understanding the guidelines helped expedite this and in July my Wikipedia page was approved. Craig is presently the Dean of The College of Continuing Studies at the University of Alabama. He is deeply involved in craft research and writing and I greatly appreciate his work on my behalf. June 2015 - In mid June 2015, I participated for the third time in the Echo Lake Collaborative at Bucks County Community College. This event is a fundraiser for the Bucks County Chapter of the American Association of Woodturners. Approximately 55 artists work in the college art building and shop for 2 1/2 days collaborating to make interesting and beautiful work that is sold at auction on the evening of the third day. This year’s auction raised over $17,000 which was a new record. The highlight of this year’s Echo Lake for me was being reunited with Romanian spoon carver and friend Zina Burloiu. Zina and I had become friends when she visited our home for 4 days in 2001. While we had corresponded some we had not seen each other for 14 years. We worked the entire time together and produced one spoon, one letter opener and one bracelet which contributed $1500 to the cause. Here are shots of us and of our three collaborative works. April 2015 - I received the CWA Excellence in Wood Award at the 2015 Smithsonian Craft Show. Jurors for the Collectors of Wood Art were Dave Long, Keith Holt, and Terry Evans - The award came with a $1000 check and I was very honored that they responded strongly to my newer sculptural work. You can read more about wood at the Smithsonian Show here, and see the photo here. February 2015 - I received the Excellence in Wood Award at this year’s Baltimore ACC Show. In addition I received guaranteed acceptance for next year’s show and a nice check for $500. The award was sponsored by the Collectors of Wood Art and the jurors were CWA member collectors Al Selnick and Joe Seltzer as well as member artist, Rick Crawford. Here are a couple photos taken by Miriam Rosenthal. January 2015 - WV Living magazine visited my studio and home last year and published an article about my work in their Winter 2014 issue. You can read it at this link: http://www.wvliving.com/Winter-2014/Stirring-the-Soul/ or here. The same photo of my sculpture, Homage, appears three times in this issue and is mentioned in the text. Thanks to the Yale University Art Gallery for loaning it for this show. October 1, 2014 - Collectors, Ruth and David Waterbury, have given one of my spoons to the Minneapolis Institute of Arts. This spoon (seen here) has traveled with the wonderful show and book, Conversations with Wood, The Collections of Ruth and David Waterbury, and now will become part of a notable pubic collection. Thank you to Ruth and Dave for their generous support. October 2014 - The Center for Art in Wood in Philadelphia is using an image of my sculpture, Homage, in their promotion of their upcoming show (see pdf here) about the Influential wood artists and teacher, Emil Milan. This show is the second of two shows resulting from research I’ve done over the last 7 years with Barry Gordon and Phil Jurus. Three of my spoons were juried into the Tenth West Virginia Guild Competition. This show will be exhibited first at the Parkersburg Art Center fall of 2014 and move to the Wheeling Artisan Center in January 2015 and last to the Huntington Museum of Art in March of 1015. Images of my 3 included spoons are here. September 2014 - The Tamarack Artisan Foundation has given me one of four Tamarack Artisan Foundation Fellowships for 2014. Click here to read the News Release. June 2014 - I am part of a three man team conducting research for the past 7 years on the life and work of Emil Milan . The Penn State Great Valley campus near Philadelphia offered us the chance to mount a Milan exhibition and it will be opening June 9. This is the first exhibition of Milan's work since his death in 1985 and only the second one man show for him ever. In the late 1960s and the early 1970s the Penn State Cooperative Extension Service sent master crafts artists all over PA to teach in hopes of improving the "industry" of craft for the benefit of the PA economy. Milan's work is included in the collections of the Museum of Arts and Design, Smithsonian American Art, the Yale Art Gallery, and the Center for Art in Wood. My first teachers, Phil and Sandye Jurus, were students of Emil Milan. Phil is part of the Emil Milan Research Team. The power carving techniques I use to carve my spoons evolved from those taught by Milan even though I never met him. In fact Milan influenced many woodworkers directly and indirectly with his early advocacy of and innovations in power carving. The show invitation is available here. The exhibition will be open all summer so if you cannot attend the opening please consider attending the show if you are in the Philadelphia area over the next 3 months. Note: If you are only in Philly on a weekend call the provided number well before to perhaps arrange for the Henry Gallery to be opened for your visit. I have six spoons in this show and the work of all the carvers is definitely worth a visit to the site. My spoons may be seen here. April 2014 - "Monument Valley" was accepted for inclusion in Beyond Boundaries, a Collectors of Wood Art sponsored exhibition to be held at SOFA Chicago 2014. Selections were made by Emily Zilber, the Ronald C. and Anita L. Wornick Curator of Contemporary Decorative Arts at the Museum of Fine Arts in Boston. With applications from over 100 artists, Emily had to make many difficult decisions among the hundreds of high quality works submitted. 25 artists' work will appear in the show. The works chosen exemplify creativity, outstanding workmanship, and aesthetically appealing design elements. Aligning with the theme of "Beyond Boundaries", the works are diverse in object type, use of material, technicality, and conceptual approach. The dates for SOFA 2014 are: Opening Preview Night - Thursday, November 6th, 5-9pm; General Fair - Friday, November 7th through Sunday, November 9th. Additional information regarding this special wood art event will be posted at the CWA site and here as it is made available. This short interview for the Collectors of Wood Art website was conducted by Caroline Stevens and is part of her ongoing series probing CWA member artists about their work. Read the interview here. January 2014 - The Yale University Art Gallery announced the accession of my cocobolo sculpture, Homage, in the present issue of the Yale University Art Gallery Bulletin of 3013 Acquisitions. In addition a spoon carved from Conkerberry and another carved from Amboyna Burl were also added to their permanent collection. All of these pieces were donated to Yale by Kenneth Spitzbard who has been supportive of my work for many years. My thanks go to Mr. Spitzbard and to Curator of American Decorative Arts at the Yale Art Gallery, Pat Kane for their hard work on my behalf. You can view the Bulletin by clicking this link. You can view the works by clicking here. December 2013 I have 4 spoons on exhibition at the Wayne Art Center in Wayne, PA from December 6, 2013 to January 25, 2014. They are part of a show entitled, Nature in Craft. This is a new show mounted as a companion to the Wayne Art Center's yearly Craft Forms international juried exhibition. Here are the four spoons shown. For the duration of the show these pieces are only available from the Wayne Art Center. Details of both Nature in Craft and the parent show Craft Forms may be found here. The Wayne Art Center is a wonderful facility and both shows feature some of the best craft art being made today. October 2013 - Naming spoons has often been a challenge with many spoons going unnamed over the years. Earlier this year Charles Mak contacted me with questions about my naming process. He had been asked to write on that subject for the British magazine, Furniture and Cabinetmaking, December 2013 issue. Click here to see the result including a photo of Partial Eclipse, my spoon from 2005. October 2013 - Thanks to Patrick R. Benesh-Liu for including a photo of Perseid, my spoon from early 2010, in the present issue of Ornament Magazine. The article was their annual tribute to the Philadelphia Museum of Art Craft Show in advance of the opening of the show the first weekend in November. Click here to see the entire article. May 2013 - The acquisitions committee of the Fuller Craft Museum has accepted the donation of 5 spoons to their permanent collection. Two were donated by Pat McCauley and three by Rebecca Klemm. Images and descriptions of these spoons can be seen here. 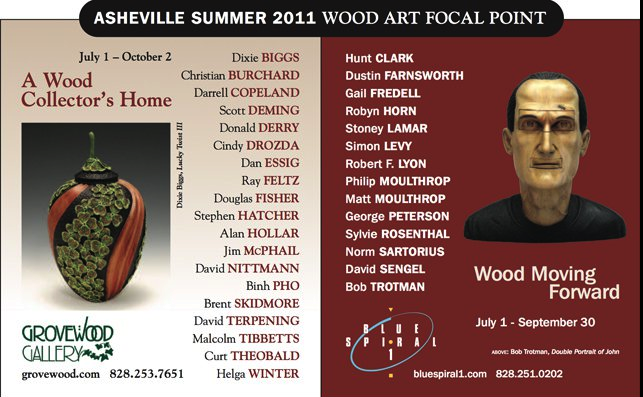 May 2013 – In addition to my work being added to the collection of Fuller Craft Museum and being on display in an excellent wood art show there, an image of one of those pieces was used on the cover of the show catalog. Rebecca Klemm's donated piece, Kneeling Spoons, appears on the cover in the upper right corner. Click here. April 10 – September 22 – Across the Grain: Turned and Carved Wood - this exhibition includes five spoons recently donated to Fuller Craft and two spoons on loan from the collection of Fleur Bresler – additional information available here. April 24, 2013 - Martha Stewart was the Honorary Chairman of the Smithsonian Craft Show for 2013. She appeared at the opening of the show visiting most booths including mine. Click here to see photo: In addition, on the following day, I appeared on Martha’s live show on SiriusXM Satellite Radio. I was briefly interviewed by Martha’s craft editor, Hannah Milman. You can see 60 photos of the show here. April 2013 – The May 2013 issue of The Crafts Report contains an article entitled Stirring the Soul, Norm Sartorius Elevates Spoons to Fine Art. Pages 32 through 37. The Crafts Report is a trade publication in support of working craftspeople, their work and their careers. You may view the article and magazine cover here. January 2013 - Black silhouettes of two of my spoons are now part of a public art project decorating the outside of the Center for Art in Wood, Philadelphia. Titled Written in Wood, the mural is part of Philadelphia’s extensive Mural Arts Program. This work by acclaimed artist Benjamin Volta depicts selected works from the permanent collection of the Center. You can see how it looks from the street here as well as a postcard revealing the silhouettes used on the wall. This is a permanent installation. Additional information about the Center for Art in Wood may be found here. February 2, 2013 – April 6, 2013 - Three of my spoons will be part of a show at the Craft in America Study Center, 8415 W. Third Street, Los Angeles, CA. They are part of a show entitled Good Enough to Eat: The Fusion of Food and Craft (Food as Subject for Craft) None of these are for sale. Two are from Diane Bosley’s collection and the remaining one was generously loaned by William and Paula Mitchell for this exhibition. Click here for images of these spoons. Additional information about the exhibition and the Study Center may be found here. September 2012 - “Homage” is donated to the Yale Art Gallery – My thanks to Ken Spitzbard for his willingness to give this piece to Yale. September 2012 - “Conquistador” is purchased by the Renwick Gallery, Smithsonian American Art Museum thanks to generous donations by Fleur S. Bresler, S. Bruce and Eleanor Heister, Patricia A. McCauley, James L. Pavitt and Carolyn K. Stettner, and Kenneth Spitzbard. This spoon was chosen by Nicholas Bell, The Bresler Curator of American Craft & Decorative Art at the Renwick Gallery during the 2012 Smithsonian Craft Show. Late September 2012 - Attended the 2012 CWA Forum in Little Rock, Arkansas. Visited the Arkansas Arts Center and the Clinton Library. Spent a day at Robyn & John Horn’s taking in their collection and participating in a 3 hour sale along with over 20 other artists. On Sunday we visited Crystal Bridges Museum of American Art in Bentonville, AR. The architecture of this brand new museum is as much an attraction as the art it contains. It was a wonderful event shared with like minded collectors and artists. October 2012 – Two of my spoons, Madagascar Rosewood Spoon and Cocus Spoon, were donated by Robyn and John Horn to the Columbus Museum in Columbus, Georgia. Collectors of Wood Art Forum 2012 Little Rock, AR More than 60 member artists and collectors will return to the site of the founding event for the Collectors of Wood Art to enjoy a day at the home of John & Robyn Horn. In addition there will be visits to the Arkansas Art Center and the Clinton Library ( White House Craft Collection). Artists will show work during the weekend. Details here. May 21 to June 10 – Poplar Culture – The Wharton Esherick Museum is sponsoring this fundraiser featuring 50 works of art made from a tulip poplar tree that grew next to Esherick’s studio. I have three spoons in this exhibition, all of which were inspired by Esherick sculptures and all made from that tree – the spoons may be viewed here. Additional information may be viewed here or from this website. April, 2012 – In early April, my wife, Diane and I visited our son, Andrew, in Japan for two weeks. He teaches high school English there. We saw many wonderful temples and shrines, some hundreds of years old. We also saw ancient Buddhist and Shinto wood sculpture that was as expressive and beautifully done as a Michelangelo stone carving. Trees in Japan are groomed and shaped much in the manner of Bonsai and are living sculptures. We also saw antique Japanese boxes, utensils for tea ceremony (bamboo), and even had the opportunity of buy a small sample of two beautiful woods for my work. Time will tell whether or not this visit will influence my own carving but we took a lot of photos of trees and wood objects for future inspiration. Everyone we met there was kind and generous far beyond our expectation. April, 2012 – My work received the Silver Award (effectively 3rd place behind Best in Show and the Gold Award) at the recent Smithsonian Craft Show. This was for the body of work presented rather than a single piece. The Awards judges were Nicholas Bell, Renwick Gallery Curator of Craft & Decorative Art, Dr. Oscar Fitzgerald, Professor, Smithsonian/George Mason University for Masters in the History of Decorative Arts, and Carol Sauvion, Executive Director of Craft in America on PBS. 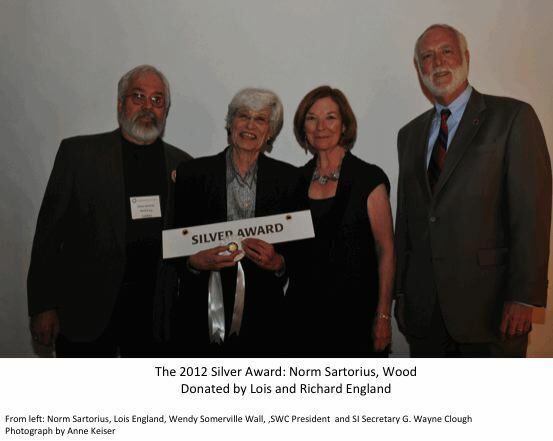 My thanks go to Lois and Richard England for donating funds for this award. For photo click here. April, 2012 – American Woodworker magazine # 160, June/July 2012, has an article about my work in their regular feature “A Great American Woodworker”. Thanks to author Spike Carlsen for considering me and to Senior Editor, Tim Johnson, for working with me to improve the entire presentation. A pdf of the article can be viewed here. February 1, 2012 - Ron and Kay Springwater have donated 44 of my letter openers to the Racine Museum of Art. Each carved from a different wood, this collection covers the evolution of handle and blade forms from 1993 to 2011. It represents well over half of the letter openers they have purchased during the that time. I am very grateful to the Springwaters for their consistent support and friendship. These are the first letter openers of mine in any public collection. Click here to see images of some of the donated collection. August 25, 2011 - One of my spoons was shown and briefly discussed on the WTTW, Public Television show Chicago Tonight. You may view this 7 minute segment here. The woman speaking about my spoon is Carol Sauvion, the producer of the national PBS show Craft in America. This is a regional show and I will have 7 spoons included in the exhibition. Another wonderful Asheville gallery, Grovewood Gallery will also feature wood art during the same time period. See exhibition flyer here. June 30th at Blue Spiral 1. June 22- 26 - I will be attending the 25th Annual Symposium of the American Association of Woodturners in St. Paul, MN. This will also be the site of the 2011 Collector¹s of Wood Art Forum. I will have one spoon, one letter opener, and two bracelets on display as part of the Historical Woods of America exhibit. My pieces are made from Mulberry Burl from George Washington¹s home, Mount Vernon as well as wood from a Poplar that was part of Thomas Jefferson¹s garden at Monticello. 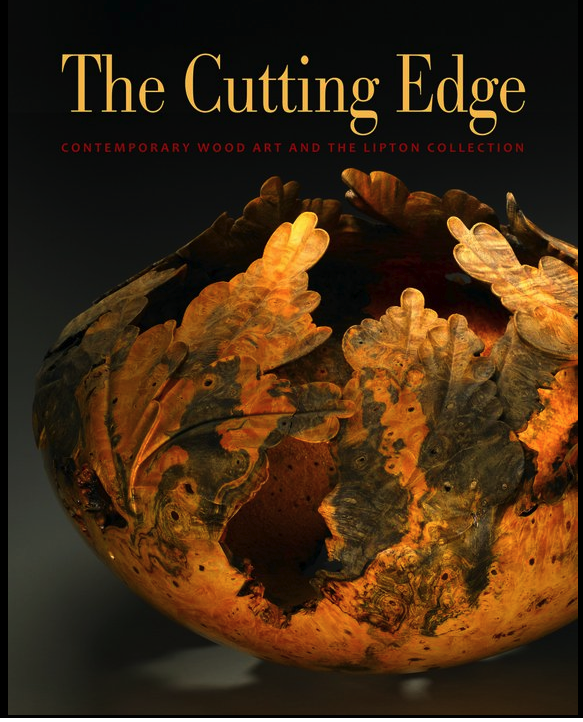 During this weekend there two new woodworking books will make their debut: The Cutting Edge: Contemporary Wood Art and the Lipton Collection: by Kevin Wallace I have not seen this book yet but I know that some of my spoons are shown. Click here for an image of the cover. Conversations with Wood: Selections from the Waterbury Collection ­ This is both a book title and an exhibition at the Minneapolis Institute of Arts (MIA) - see the press release pdf here. I have one spoon (shown here) in both the book and exhibition. This book will be available from the AAW, as well as from the MIA and the Yale Art Gallery bookstore. April 2011 – The Ashville Museum of Art (NC) has acquired three of my spoons thanks to a generous donation by Robyn & John Horn. These are all early works from 1990 and 1991. Your can click here to see them. March 2011 - Thanks to a generous donation by Ron and Anita Wornick, the Racine Art Museum has acquired one of my spoons for their permanent collection. Mahogany Ladle, 1996 – 2.75 x 4.12 x 18.25 inches. In addition I learned that Mahogany Ladle, 1996 had been on display at RAM from September 26, 2010 to January 9, 2011 as part of an exhibition called Knock Wood, New Gifts to RAM’s Collection. Mahogany Ladle, 1996 may be viewed by clicking here. November – During the SOFA Chicago Show the Collectors of Wood Art held a special exhibition called “Is Ornament a Crime”. This show was curated by Cindi Strauss, then the decorative arts curator of the Museum of Fine Arts, Houston. The challenge to artists was to not embellish surfaces with color, texturing, burning, etc. Instead she wanted a return to more pure form and line on natural wood surfaces. My work “Homage” was biographical and expressed the debt I owe PA/NJ craft artist Emil Milan (1922-1985) Milan taught my first teachers and even though I never met him I believe my work has been greatly influenced by his style of work and tool use. This work was carved using a piece of Cocobolo discarded and recovered from Milan’s derelict barn studio near Thompson, PA. There was a catalog published documenting the show. Click here to see Homage and here to see the catalog cover. November 5 – 7 - del Mano Gallery’s exhibition at 2010 SOFA Chicago, . del Mano is the leading gallery in the US focusing on wood art. Click here to see the spoons included in this exhibition. September 24, 2010 – The long awaited exhibition A Revolution in Wood: the Bresler Collection will open at the Renwick Gallery, Smithsonian American Art Museum in Washington, DC. In addition there is a book with the same title published by the Smithsonian which includes images of the 66 works of Wood Art donated by the Breslers to the Renwick. I have several spoons in this exhibition and book. http://americanart.si.edu/exhibitions/archive/2010/bresler/ This show will travel to several museums in the United States starting in 2012. Click here and scroll down to see my spoons in the collection. On the opening day of this show I will be a panelist for a roundtable discussion of the Bresler’s collection. Curator Nicholas Bell, collector Fleur Bresler, and wood artists Michelle Holzapfel and Mark Lindquist will also be on the panel. June 2010 – the small book A Gathering of Spoons, Selections from the Collection of Norman Stevens, becomes available from the AAW Gallery of Wood Art, http://www.galleryofwoodart.org , you may view the book here. June 2010 – I spent a wonderful day researching the exhibit history of Emil Milan at the Newark Museum of Art in the 1950’s and 1960s. He was the leading seller of craft over this period of time at the museum’s annual Christmas crafts show. June 2010 – I attended one day of the AAW Symposium in Hartford, CT primarily supporting Norman Steven’s spoon exhibit there. I was there long enough to understand that these are wonderful events and I should make an effort to attend future symposia where possible. May 2010 - I have 3 pages of text and photos in the new book Wood Art Today 2 by Jeffery Snyder, from Schiffer Publishing. This is an opulent coffee table book profiling the work of many of today’s leading wood artists. Click here to view the cover and my contribution. I have 3 spoons in the show Contemporary Wood Art: Collectors’ Selections presently on exhibit at the Wood Turning Center in Philadelphia, PA. Two are from the permanent collection of the WTC and one is for sale (Twig Spoon, 2007, Available Work) - this show will close on March 20, 2010. Click here for more information. I have one spoon in the new exhibition A Gathering of Spoons at the Gallery of Wood Art operated by the AAW in St. Paul, MN - - this same exhibition will be part of the Annual AAW Symposium in Harford, CT in June. There will also be a small book/catalog available in Hartford to accompany this exhibit. Both of these shows reveal part of collector, Norman Stevens, vast collection of 9 inch wooded spoons from in excess of 175 makers around the globe. December 7, 2009 - We stopped at the Carnegie Museum of Art in Pittsburgh to see the newly re-opened decorative arts area; the Ailsa Mellon Bruce Galleries of Decorative Arts and Design. The entrance takes you past some very ornate French furniture then around a U shaped space where the display transitions to more contemporary work. At the end just before you pass through the exit doors are two wall cases with glass fronts. The one on the right has 4 of my spoons. The spoons are in with two Ellsworths, the 3 generations of Moulthrup, and two Hunters. The second case, even closer to the exit door, has Harvey Fein on the wall, Ron Kent and Rude Osolnik on upper shelves and Liam Flynn, Virginia Dotson, Ron Layport, Bin Pho, John Jordon, and Michelle Holzapfel going left to right. You can see images here. This decorative arts room of the Carnegie has been closed for a long time for renovation and restoration. More here. November 11, 2009 – Awarded Best in Show at the Philadelphia Museum of Art Craft Show. Click here to see a very surprised and happy spoon carver. October 1, 2009 – Awarded $14,000 Craft Research Fund Grant from the Center for Craft, Creativity and Design. For 15 months I have (along with friends and research partners Phil Jurus and Barry Gordon) been researching the life and work of deceased woodworker Emil Milan (1922-1985). Phil Jurus was my first woodworking teacher in Baltimore in the mid 1970s. He studied under Emil Milan. We wanted to learn more about this undocumented carver and teacher and we wanted to make our findings available to museums and universities with an interest in Milan. This is an ongoing project which will end in early 2011. 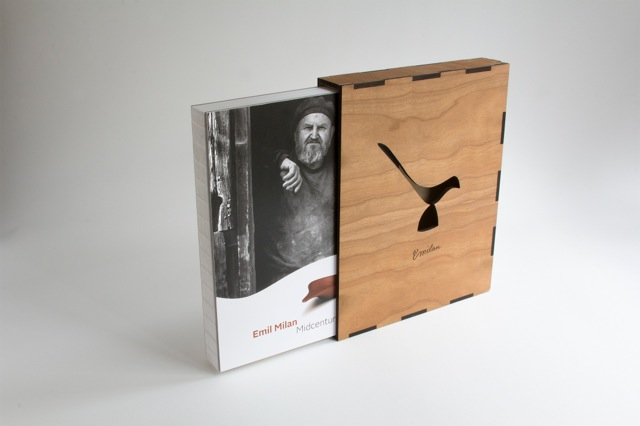 An article written by team member Barry Gordon recently appeared in the Winter 2010 issue of Woodwork magazine profiling Emil Milan’s life and work. You can read that article here. June 3rd – June 6th, 2009 - Echo Lake – Buck County Community College - I was invited to participate in this wonderful annual collaborative event modeled on the Emma Lake International Collaborative in Canada. It was a fantastic event shared with imaginative and talented artists including Betty Scarpino, Malcolm Zander, Mark Sfirri, Michael Mocho, Bill Smith, and Derek Weidman. Click here to see images of the pieces to which I contributed. May 2 – June 6, 2009 – Turned Wood –Small Treasures – del Mano Gallery - This annual exhibition of small work included 3 of my spoons. You can see these spoons and the rest of this wonderful show here. March 6 – April 11, 2009 – Selections From the Collection: Donations by Bruce Kaiser and Joe Seltzer - One spoon from the permanent collection (Amboyna Burl Spoon – Donated by Bruce Kaiser) and one new spoon which is for sale ( Mystery Spoon) are part of this exhibition. You may view the show online here. January 2009 – John & Robyn Horn donated two of my spoons to the Museum of Fine Arts, Houston. To view the spoons, click here. January 2009 – Bruce Kaiser donated my 1995 large Amboyna Burl Spoon to the permanent collection of the Wood Turning Center. Click here to see it. December 5, 2008 - February 13, 2009, In the Palm of Your Hand. I have 5 spoons in this show at the Messler Gallery which is part of the Center for Furniture Craftsmanship in Rockport, Maine. Click here to see these spoons. November 2008 – Thanks to the generosity of longtime collector and friend, Pat McCauley, three of my spoons were acquired by the Philadelphia Museum of Art. October 3, 2008 – January 17, 2009, dysFUNctional, Wood Turning Center, Philadelphia, PA. I have one spoon in this show called “Old & in the Way”. There is a book of the show. The entire show will tour for 3 years after it closes at the Wood Turning Center. You can see much more about the show at www.woodturningcenter.org. To see “Old & in the Way”, click here. Early August – I attended the Emma International Collaborative for the second time – it was a fantastic week of work outside my usual parameters shared with 100 wonderful artists from North America, Australia, and New Zealand – pieces I worked on appear in both the Archives and Available work sections. To see these pieces click here. Summer 2008 – An article about my work is featured in the Summer 2008 issue of The Hill, the alumni magazine of McDaniel College. It largely repeats Terry Martin’s article from Woodwork June 2006 with some new photos and text. See the Biography for the full article. January – Attended CWA Forum in Scottsdale, AZ and exhibited 5 spoons in the del Mano Gallery display. January – The Art of Wood Jewelry , Lark Books, is published. One of my bracelets is featured on the book jacket and I have a how-to article inside about the making of one design along with a couple more photos. Gregg Museum of Art & Design, North Carolina State University, Raleigh, NC, January 2007, three spoons donated to the permanent collection by Robyn and John Horn. Woodwork Magazine, Issue 104, April 2007, Page 18, Craft in America article, “Bee the Spoon” photograph. Turned Wood Small Treasures, Del Mano Gallery, March 17 through April 14, 2007, three spoons exhibited. American Craft Show in Baltimore, February 2007. “Bee the Spoon”, Craft in America touring exhibition, Little Rock, Arkansas, Portland, Oregon and San Diego, California, 2007. Michael Hosaluk: Containment Exhibition, Mendel Art Gallery, Saskatoon, Saskatchewan, Canada, January 19 through April 2, 2007 - The exhibition was based on Michael Hosaluk providing a basic small wooden chair frame to 20 artists to change, enhance, adapt in any manner they wished. My chair sculpture reflected a health issue that became the dominant event in my life at the end of 2006. Regional 07, Parkersburg Art Center, May 6 through July 1, 2007, “Emma Perfect” from Emma Lake 2006 and a sculpture, “Spoon Dreams II” were exhibited. “Spoon Dreams II”, Second Place Award in the 3D category. Bethesda Public Library, Bethesda, MD, May 1 to June 3, 2007, a spoon exhibited from the collection of Arthur and Jane Mason. American Craft Exposition, 2007 – Award of Excellence. WV Juried Exhibition 2007, “Spoon Dreams II” and “Pan’s Mandrake”. Merit Award for “Pan’s Mandrake” owned by Karen Depew and Steve Keeble. Parkersburg News and Sentinel, September 2, 2007, Article “Art Bias” – Photo with “Spoon Dreams II”. Philadelphia Museum of Art Craft Show – November, 2007. Washington Craft Show – December 2007. Nominated to the Board of Directors of the Collectors of Wood Art.